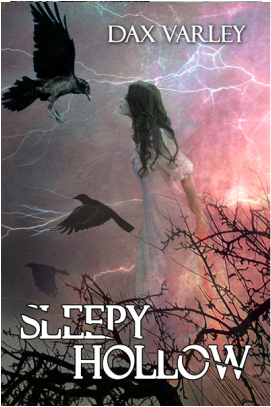 Now it’s up to her to sever the horror and alter the Legend of Sleepy Hollow. The Horseman…he is real. He came for me. I sat, gazing out my chamber window. A ground mist had collected, hovering over the glen. Then I heard him, distant at first, approaching within the fog. His race with the night thundered a rhythm. My heart drummed to each beat. Within moments, I saw him—a headless outline of black within a gray cloud. As though sensing my eyes upon him, he slowed his phantom steed, circling once. The horse reared, pawing the haze. The Horseman quickly drew his sword and sliced the air. I dropped down below the windowsill, my breath coming in shallow gasps. Had I doomed myself by daring to peek? I quivered, hugging my knees. He is not real. He is not real. Moments passed. Then slowly, I inched to the edge of the sill. Hiding in the shadows, I moved the curtain just a whisper. The Horseman was still there, but now he’d turned…toward my window. My heart hammered and my blood ran as cold as the Hudson River. His hand reached out—beckoning…inviting …bewitching me. A gray breath of evil played upon my neck, and my name wafted through the mist. I struggled against the force that summoned me, tightening every muscle, every nerve, refusing to move an inch. My body quaked, but I kept my mind as sharp as the Horseman’s blade. I will not come. I will not. When I thought I couldn’t hold back a second more, he spurred his massive steed. And like a midnight blast, he flew, charging across the countryside. I collapsed, trembling, heaving. Finding strength, I crawled upon my bed. I dared not move. I dared not sleep. I lay within my quilt, knotted in fear. The Horseman…he is real. He came for me. And I knew not when he’d return. It’s a simple game, really. A game that I call “Someday.” I close my eyes, spin a globe, and then draw it to a stop with my finger. When I open my eyes, there it is—the place I’ll visit “someday.” My diaries were filled with someday destinations. Vienna. Cairo. Burma. Someday I would visit every one. Oh rot. We’d been working the ledgers for over an hour, and the numbers were bleeding together before my bleary eyes. Our three hundred acres had produced a particularly abundant harvest, and Father insisted on registering every grain. I picked up the blotter and rolled it over the fat droplet, then glanced at the remaining notes and vouchers. Sigh. I’d rather jab this quill in my eye than continue tabulating. But as always, I pressed on. Being the only child of the wealthiest man in Sleepy Hollow meant that “someday” I was to inherit this farm—keep his empire intact. But that was the “someday” Father had planned. Some ten minutes later, the door to Father’s study opened. Hans Van Ripper, an old farmer, came in, nervously tapping his hat to his leg. His face was dark and shadowed, and he heaved like he’d limped all the way here. “Go on, Katrina,” Father said, making shooing motions with his hands. “Fine.” At least I was getting a break from the ledgers. But there was something behind Van Ripper’s tense expression that told me this was news I needed to hear. I rose, passed between the two of them, and then quietly closed the door. I made a few thumping noises to sound like I’d retreated, then, as lightly as possible, placed my ear to the door. A thousand pinpricks needled my skin. I pressed my palms to the door for support. The Horseman’s back. The air thinned. I struggled for breath. Nikolass? True, he was always clumsy, dry, and poorly dressed, but he was a fine teacher who’d only settled here last winter. Before then the children had been educated at home, as I had. Why him? The others. Old Brower and Cornelius Putnam—two villagers beheaded. But that was three years ago. Then. “And his head?” Father asked. Their words wavered in and out as I leaned heavier on the door. For three years there had been no word. No sightings. No deaths. And now…? Bile clogged my throat. I couldn’t shake the chilling image of Nikolass—a heap of blood and limbs, sprawled upon a circle of blackened ground. “Who would dare?” Van Ripper snapped. The grave is hidden among a mass of creeping vines and cockleburs. No villager would risk going near it. I had always heard this—rumors that someone controlled the Hessian, conjuring him to enact their own revenge. But the schoolmaster? Nikolass, what had you done? I spun, meaning to hurry off. But I only made it a few feet when I realized--Blast!--the hem of my dress was stuck between the door and the jamb. I tugged hard, but it was wedged tight. The knob turned. I pressed myself to the wall, hoping the door would hide me when Van Ripper opened it. Once he’d passed, I could slip down the hall undetected. But it was Father who emerged, slinging it open. It swung back, slamming into me. Oomph! I tugged my creased skirt from the door hinge as Van Ripper pushed past me. Pray? Absolutely. I prayed that my “someday” would soon be at hand.